One of the hardest parts of this time in my life is waiting for clarity. I know it will come, and when it does I’ll recognize it. But until then, the waiting is hard. When I set out on my Wheels to Wisdom quest almost a year ago, the Road was unknown, but I was confident I was headed in the right direction. I still am, even though the Road led me to places I didn’t imagine. I no longer listen to the voice that used to drive me to act quickly and decisively, to work harder so I could accomplish more and achieve greater things. The voice that likes to remind me of all the dire consequences I can expect when I don’t listen. Last week during my evening walk along a lovely treed street, I was admiring the lush flower gardens and the profusion of a multitude of green shades in the carpet and leafy canopy. My eye caught an errant birthday balloon, playing in the breezes, tail dragging, skimming towards me about 10’ off the ground. 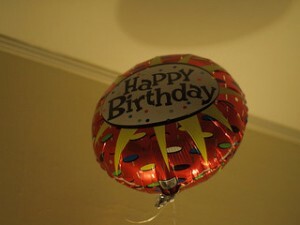 Even from afar, I knew this balloon was headed for me. When it got about three driveways away, a gust caught it and carried it up to the rooftops and perpendicularly away from me. Unswayed, I knew it was just a diversion, so was not surprised when it did a u-turn, descended and came directly towards me. I didn’t even have to raise my hand to grab it. All I had to do was open it and put it around the tail. I laughed with delight at what was a pivotal lesson. Answers, insights, and directions come to us in unexpected ways. Our role is to be open and recognize them when they do arrive. Liz’s note on September 20, 2015: Getting ready to head out on my bike and caught a flash of color in the sky. It was another balloon, sailing high a couple of blocks over on the same street where the balloon had come to me—a reminder of the lesson to know that answers and solutions come in the most unusual ways. So glad to see you’re back! I’m trying here, to impose my will on the changes life has thrown during the past couple of months. Thank you for today’s column. Good to be back. Thanks Jay! Doesn’t work, does it. Letting go sounds easy but it’s one of the hardest things to do.